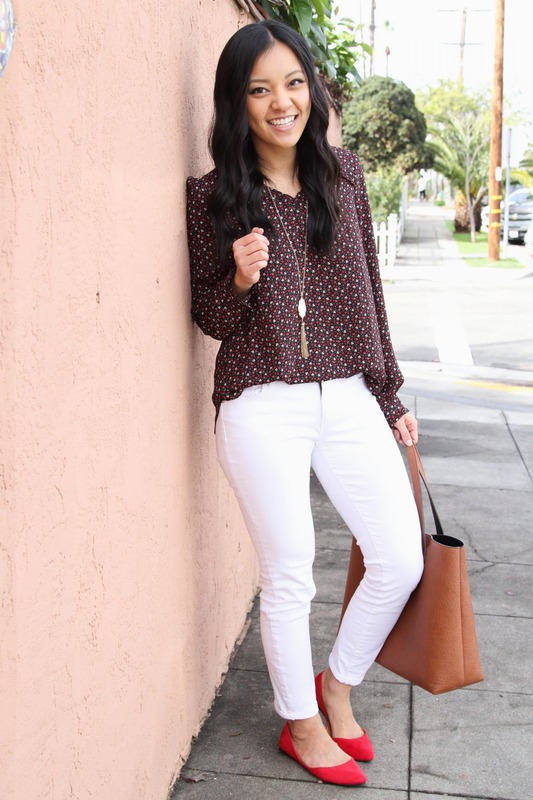 You guys know I’m obsessed with having versatile pieces in my closet, and recently I purchased this top from LOFT that I seriously can’t get enough of. It’s SO dang cute, works for casual or business casual outfits, and can be styled for winter or spring looks. 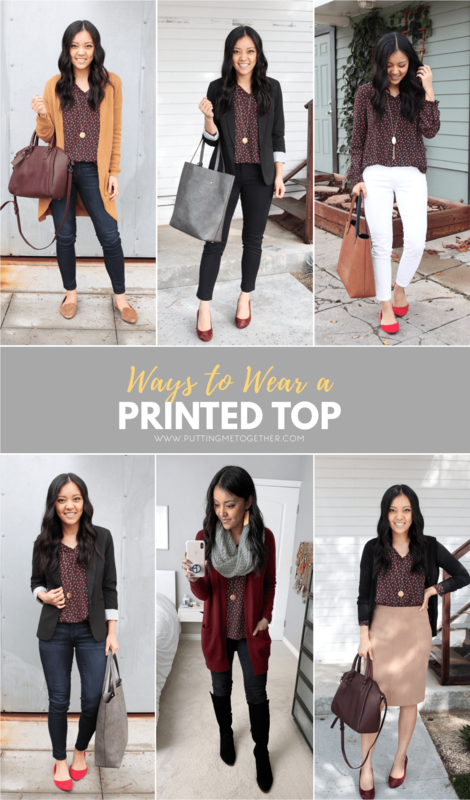 Today I’m sharing 6 different ways to wear it! This is a black-based top (I know it’s hard to tell sometimes in pics) and has cute little flowers all over that are red, coral-ish pink, and off white. Its v-neckline isn’t very deep, so it opens up the collar a bit without being revealing. It’s got puffed shoulders and cute ruffle details at the wrists to add a special touch of cuteness. Heads up that the wristbands are not elastic. That doesn’t bother me, but that could be very annoying or even problematic for some. Otherwise, super super cute top! Not sure if it’s still on sale, but at the time of writing this post (yesterday) it was on sale + an EXTRA 40% off making it only $29.99! Comes in Check it out HERE. 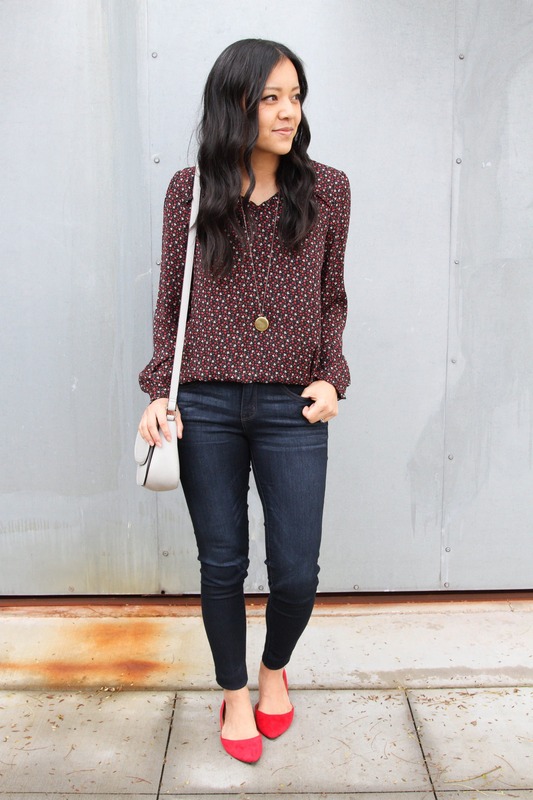 Dark florals like this top are really great for that winter to spring transition when it might still be on the chilly side or kind of dreary so you feel a mismatch wearing super cheerful colors, yet you’re itching for spring. Enter dark florals! The darker background keeps it working with more traditional winter colors like black, maroon, brown, etc. while the florals add that springy element. 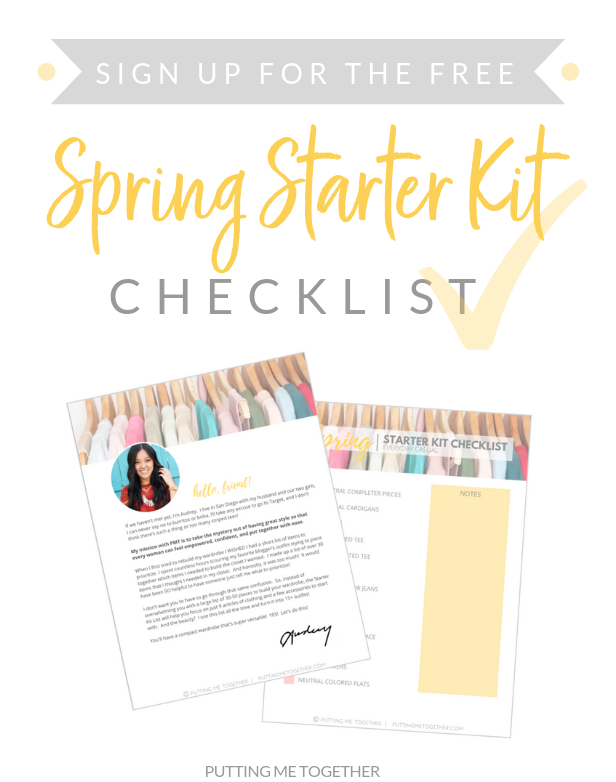 Once it’s spring you can pair it with cheerier colors, pulling any color from the print. 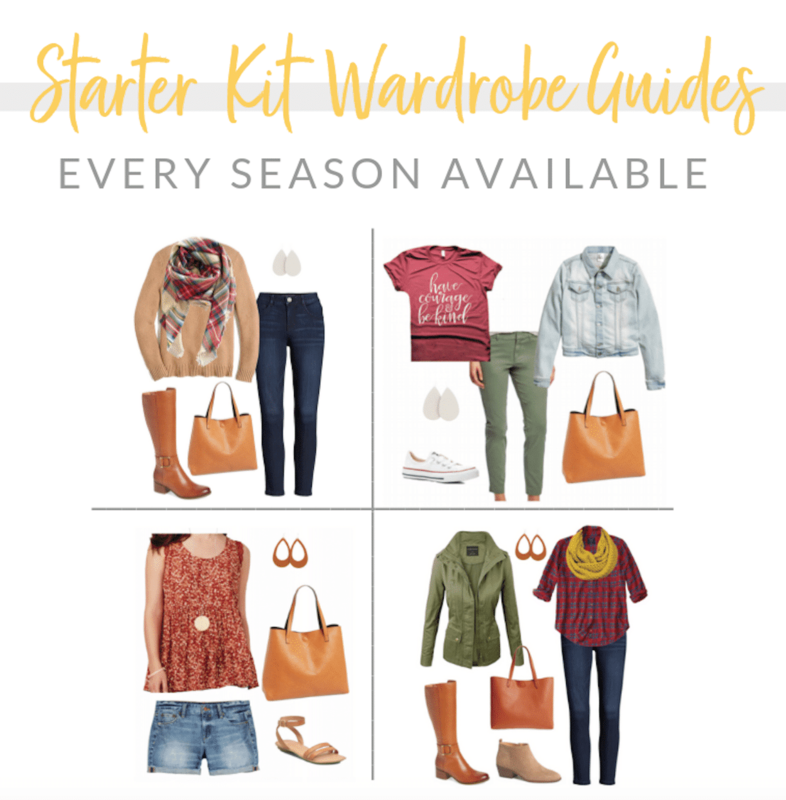 I’ll show you below, so let’s get to the outfits! First up is with jeans and tan bookends. 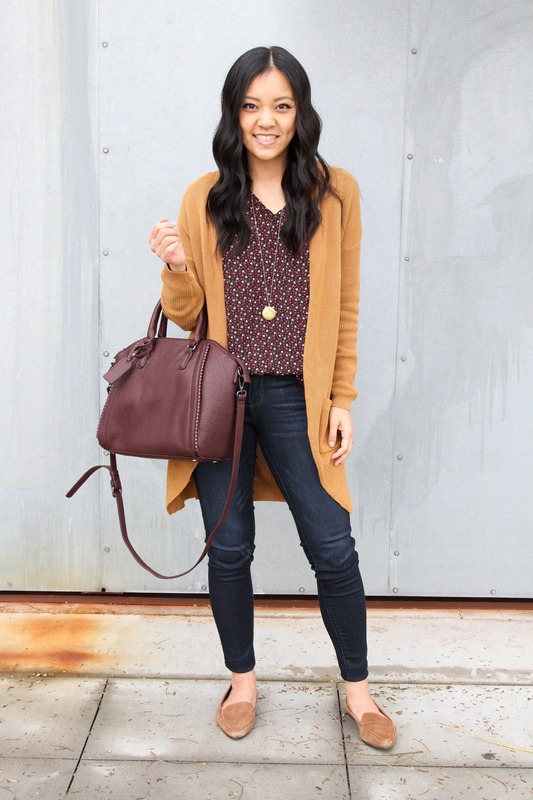 I totally love this look for fall or for that winter to spring transition period as temps begin to warm up. 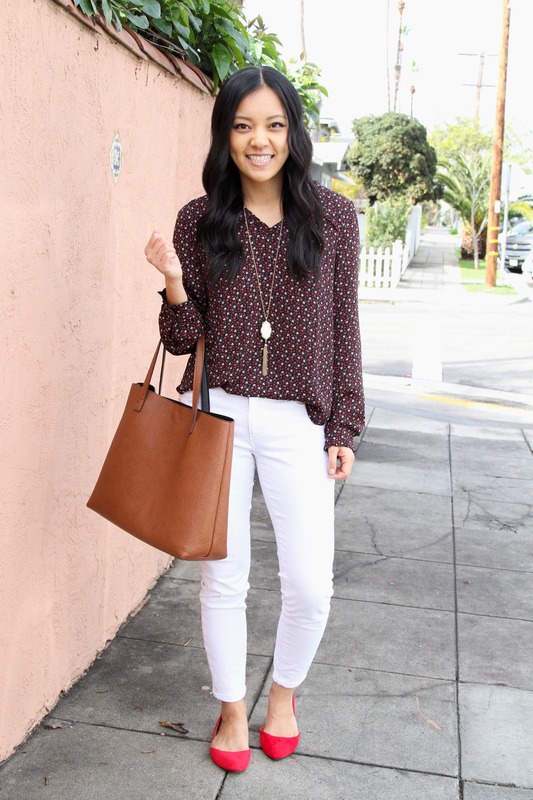 Paired it with the loafers that you guys all love–and rightly so! They’re so dang comfy! I’m wearing Chestnut Suede here, but there are a million colors which you can see HERE. 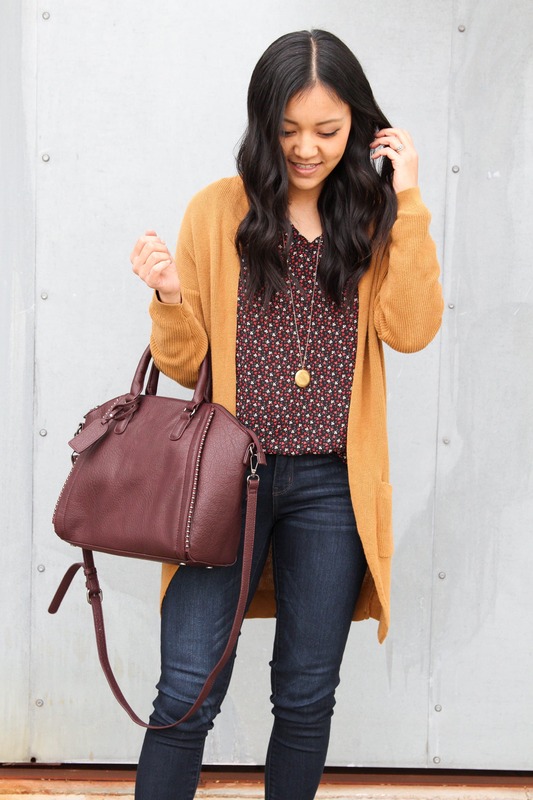 This cardigan is really old from the Nordstrom Anniversary Sale back in July 2018, but I found a very similar one by that company who makes the crazy soft sweaters I love. The cardigan is HERE. It’s VERY soft, but be warned it’ll probably fuzz and you’ll probably need a sweater defuzzer to keep it looking new. I fit Small/Medium. Lastly, this bag! Last time I showed it, several of you looooved it. It’s currently on (final) sale for $39.98! It’s a great bag. It’s fairly sturdy, a great color, and looks sophisticated with a little edge because of the studding. See it in 3 colors HERE. 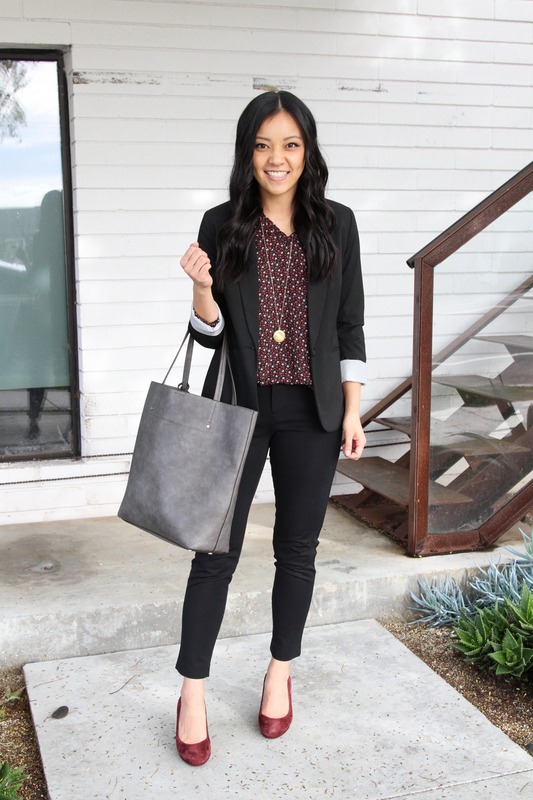 Business casual look! 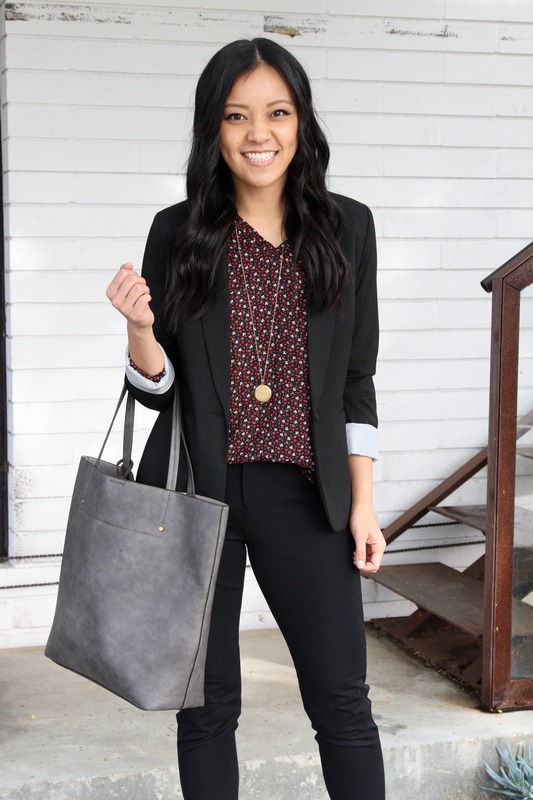 Black pants and a black blazer are pretty standard, so to make them more fun, wear them with a printed top! I added maroon pops instead of black just to give it a fun, yet subtle, pop. There’s no maroon in the print, but from far away the top kind of reads maroon! I *think* a deep red pump would work too. 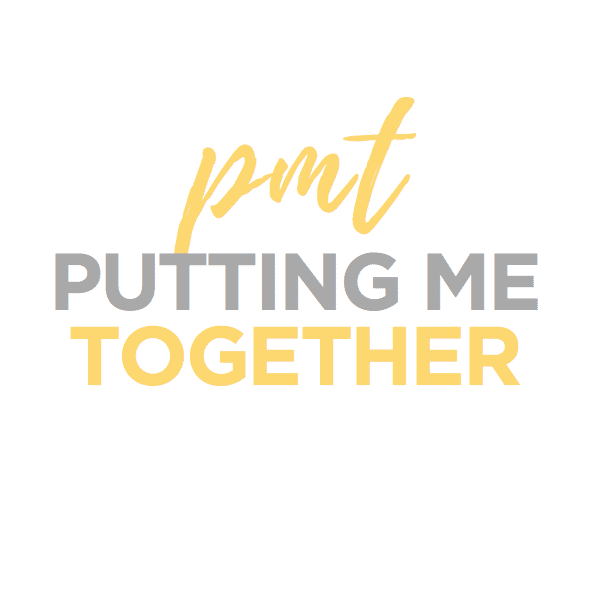 If you’re subscribed to PMT Emails you might have seen that I tried on a billion business casual pants. 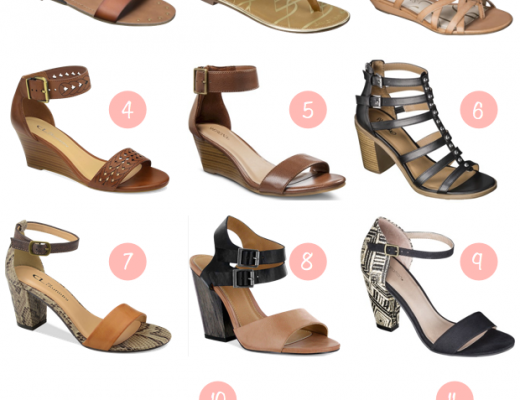 I will review each of them another time, but these Old Navy ankle pixies were my favorite! On another note, this tote is also on (final) sale for $39.98! Sturdy bag that’s fairly thick and holds quite a bit. See it in 3 colors HERE. Also, my maroon pumps are back in stock! I’ve had these for a couple years at this point (I think? Can’t remember exactly, but it’s been a while!) They have a cushioned footbed. 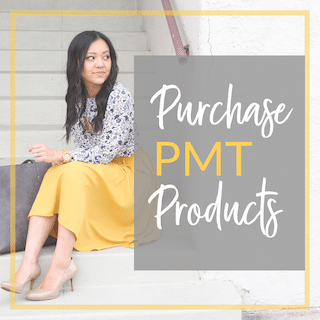 🙌🏽 If you see my business casual outfits, you’ll see that these are a staple for me. They add a pop of color in a subdued way. See other ways I’ve worn them HERE. Here’s a slight variation of the outfit above. Same top half but more casual bottom half. 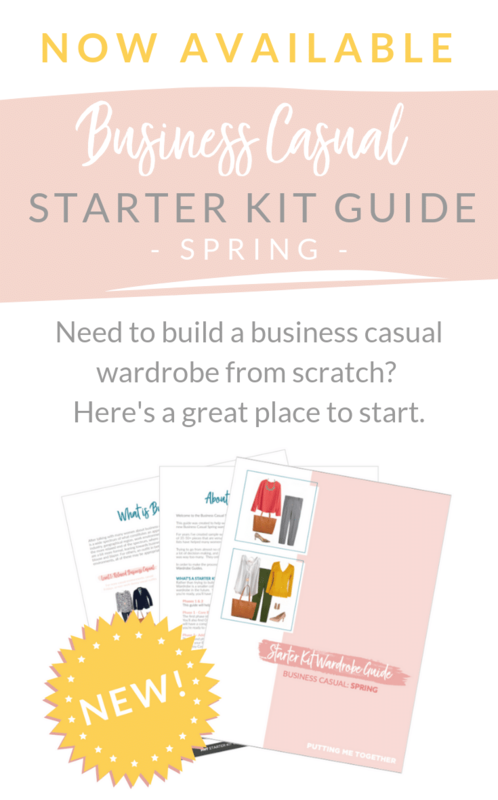 If your work environment is on the more casual end of business casual (yes, casual biz cas environments totally exist and just depend on the industry), this would be a great alternative! Or, wear it as a dressy casual look for hanging out with friends or going on a daytime date. Here’s the top with white jeans for a fun springy look! To add more continuity and crispness, I used my white pendant instead of my brass locket. 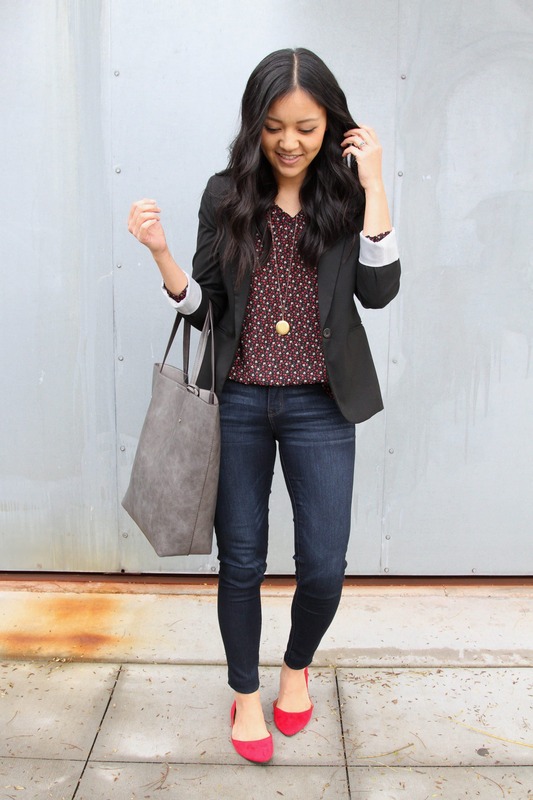 If you live in a warmer climate, this could be great for a casual Valentine’s Day outfit! 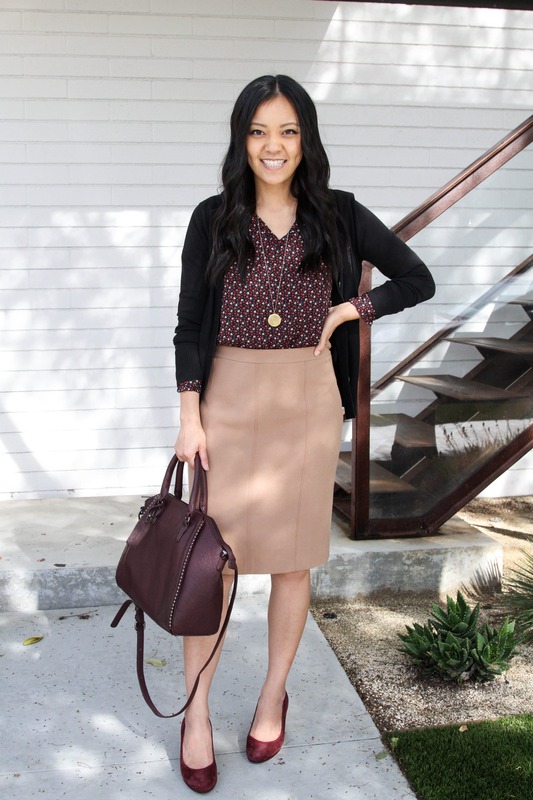 Here’s another business casual outfit with a skirt and fitted black cardigan. This would also work with a grey pencil skirt! Lastly, I forgot to snap this outfit during our photoshoot, but it’s totally necessary! If you’re still in winter temps, this is how I’d bundle up this top until the weather warms up. 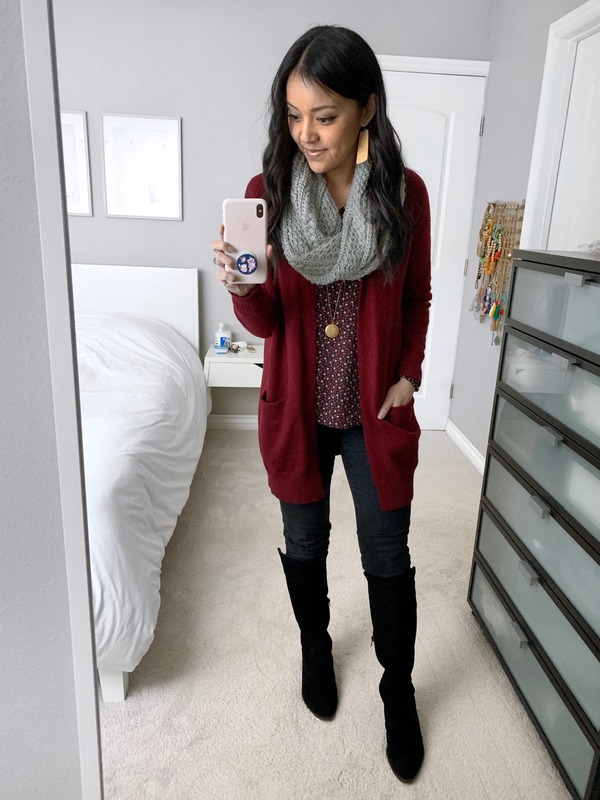 Black jeans, thick maroon cardigan, tall boots, and a scarf. Plus, when it’s colder, underneath this, I wear a UNIQLO HEATTECH. I just got the Extra Warm ones, and ohmigosh LOVE! 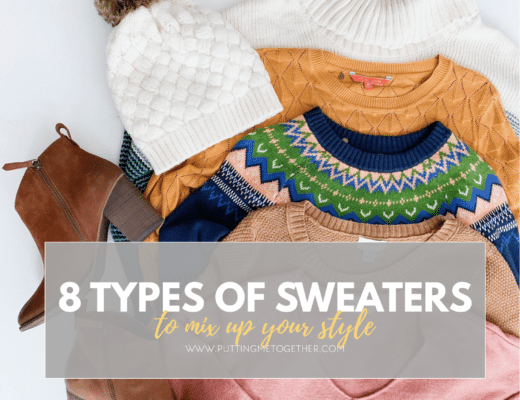 If you’re looking for more tops that work for polished casual outfits, date night, work, AND the transition from winter to spring, try some from the widget below! 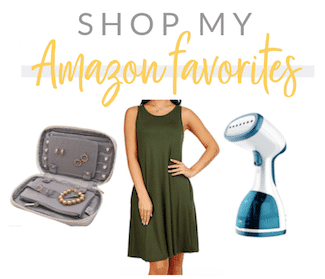 Click on an image to shop. Do your daughters leave your jewelry alone? My younger daughter is 13 months and with the way she pulls on my necklaces, I’m still afraid to wear dangly earrings when I’m going to be with her. But maybe it’s just because I don’t wear necklaces regularly enough so they’re fun and novel. My older daughter didn’t touch my jewelry when she was a baby, which I thought was so weird. First baby I’d ever held that didn’t touch my jewelry haha! Ella currently pulls on it sometimes, but so far I’ve just been removing her hand very slyly like it’s not a big deal and distracting her to something else. Also, my kids are in daycare most of the day so there’s not a ton of opportunities for her to pull on my jewelry. 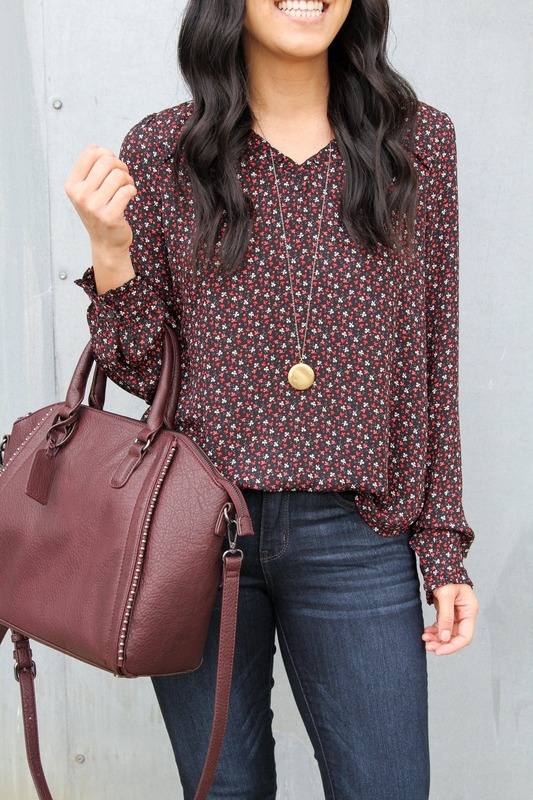 The burgundy bag looks really good with this top. Great post! I can totally see myself wearing all those outfits.